Now that my time here as an intern is coming to a close I am reflecting on my experiences and the memories that I will take away. 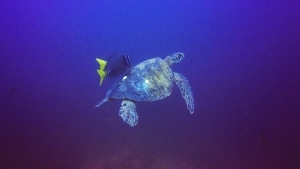 Before coming to Santa Catalina I did not have much diving experience, having dived only to Open Water level in Malaysia. I thought it would be cool to get the chance to do some diving again, but I have to say that my time here has really made me fall in love with experiencing the underwater world and I am desperate to continue! Every day in Coiba has been special. Even the days when we haven’t had our most spectacular dives you can’t help but be in awe of the park and the diversity of life in the water. And then you get those days that really are extraordinary, when the park is bursting with life and it feels like everywhere you look there is something special to see! My best day of diving happened on our instructor Kat’s birthday when our first two dives were full of big, big schools and turtles, and we shared the last dive with 2 beautiful whale sharks. Since I have been here I have been incredibly lucky enough to see whale sharks, manta rays, giant schools of sting rays and hammerhead sharks among countless other amazing things! I also, on the encouragement of Sabina, have gotten into making and editing videos from my dives – something I really enjoy doing! This and all the diving experience are skills I am so glad to have gained from my time here. I am very thankful for the opportunity that PDC has given me to be able to do this, and for all the special people I have shared my time with (particular shout out to my fellow interns / house mates!). PDC it has truly been a pleasure.